Victim Advocates are a CONFIDENTIAL resource. We provide free, comprehensive victim advocacy services to students, faculty, staff, and visitors to campus who have been impacted by crime, violence, or abuse. Advocates offer CONFIDENTIAL support, crisis intervention, reporting and disclosure options, safety planning, information and referrals, practical assistance, and educational programs. Our clients are informed of all their reporting and disclosure options and we empower them to make the best decision for themselves. We encourage reporting to the police, but we always support the choice of our clients. Advocates are available 24 hours a day to assist clients by phone or respond to the scene of a crime. To contact an advocate anytime day or night, call (407) 823-1200 or TEXT (407)823-6868. We provide crisis counseling, emotional support and safety planning in the aftermath of victimization. To empower clients to make informed decisions, advocates help clients explore their rights and options and provide information about the civil, university, and criminal justice systems. We provide referrals to on and off campus resources as needed. When requested by clients, advocates act as liaisons to professors, family members, friends, employers, landlords, creditors, and other service providers. Advocates assist with reporting to the Police and Title IX, filing injunctions for protection, provide transportation to court appearances and other required appointments, and offer additional practical assistance related to the victimization. All of our staff members are professional Victim Services Practitioners. The Florida Office of the Attorney General created the Practitioner Designation standard in 1995 in order to assure a professional level of education and knowledge for victim services providers. To maintain this designation, ongoing advanced training--to include seminars, workshops, and conferences--is required. 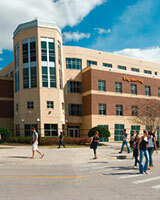 Each staff member has completed training through the UCF Safe Zone Allies program. A team member since 2012, Coretta is a proud UCF alum and holds a Bachelor’s in Psychology and a Master’s in Conflict Management. She loves sports and reading. Her favorite place to go is the beach. She prescribes herself ice cream and good music whenever she’s having a tough day. She enjoys working with people, and it is her absolute goal to make you smile! Christey has been with Victim Services since 2008. With a client-centered focus, she is particularly experienced with high risk relationship abuse, stragulation and stalking cases, as well as injunction preparation. Christey is a member of the Florida Crisis Response Team (FCRT). She is an avid gardener, witty little knitter, Hello Kitty collector, and LARP. She is married to an amazing man and has three boys at home! Lauren began working with Victim Services in 2014. She is a fellow Knight, earning her Bachelor’s in Sociology. Lauren started her career in advocacy as a volunteer at a domestic violence shelter and is committed to ending the cycle of violence. She is a die-hard UCF football fan, and even named her dog Knightro! She loves spending time with her niece, binge watching Netflix, and discovering all the things Orlando has to offer. UCF Victim Services is a member of the Florida Network of Victim/Witness Services, the Collegiate Victim Services Network of Florida, the National Organization for Victims of Crime, the National Organization of Victim Assistance, the Victim Services Coalition of Central Florida, the Orange County Domestic Violence Taskforce, the Seminole County Domestic Violence Taskforce, and the Greater Orlando Human Trafficking Taskforce. Victim Services provides prevention awareness educational programming and training in many areas related to our services. We encourage professors, student organizations, academic and administrative departments, and other organizations affiliated with UCF to request a program that meets the group's needs. Presentations can be customized for the audience with advance notice. Our programs can be interactive and informational. We request a minimum of 50 minutes for a basic presentation. If you are interested in scheduling a presentation or require more information, please give us a call at (407) 823-2425 or email askanadvocate@ucf.edu. I came in looking for a question to be answered and left with not only that, but encouragement, empowerment and a feeling of worth that I did not have before going to Victim Services. This is an excellent program with some really wonderful people. Thank you for everything.